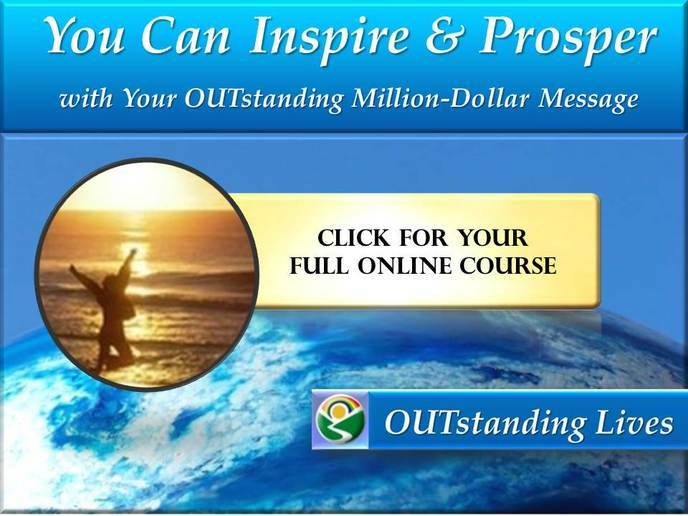 Would you like to EARN $1,000,000 inspiring the world? To apply for a scholarship, and enjoy a free introductory e-learning course, you can click here. Saving Years of Time & Saving Lives with OUTstanding Youth Quiz Game Powerpoint Presentation and Client Attraction Brochure for workplaces & schools. You can start speaking right away, even if you don't have your own program. You can use this unique new presentation researched & designedly Sharon Love, M.Ed. Just add your enthusiasm. Your Client Attraction e-learning Master Class Modules Online. Get e-learning classes every week similar to Your Free 6-Figure Speaking Course Online. Your Free Bonus Videos to help you earn a great living by making a great difference. Subliminal personal power videos, videos to help you clarify your purpose, inspiring stories, and confidence boosters so you can shine on stage. Inspiring the World & Saving LGBT Lives by supporting Gay Gay Gaymes Online Videos (for every $1,000 I earn, I produce a new free LGBT-friendly quiz game video to save lives). You can see an example on the OUTstanding Lives.org web page called "Save LGBT Lives". Your Free Fast Action Bonus ($2,500 value): If you are one of the first 5 people to register, you'll also get a free 15-minute one-to-one Breakthrough call with Sharon Love , M.Ed. (Psychology) to help you get paid $500,000 to speak & inspire your world. *If you sponsor the program, you will also get a High-Paying Client Attraction Video including a Google Plus interview of you and /or slideshow and voiceover produced by Sharon Love, M.Ed. See ticket options for details. Sharon Love, M.Ed. has helped her clients attract over $10 million & inspire the world. She has earned a reputation as the world's leading expert in empowering gay-friendly leaders (speakers, teachers and entrepreneurs) to make great money by making a difference through speaking. She earned a Master of Education degree in Multicultural Psychology from the Universe's of Toronto. Formerly a painfully shy "mute girl", Love has inspired thousands of people from around the world her dynamic presentations in Spanish, French and English. Her speaking income allowed her to travel extensively and donate thousands of hours to building teen self-esteem and saving lives of LGBT youth. In 2010, as a hobby, she inspired over 2 million people to support LGBT human rights on facebook (see the article at the bottom of the "about" page for details). Recently, one of her self-employed clients raised over $100,000 in just two months. Your 100% Satisfaction Guarantee You have 2 weeks to try the program out risk-free. If you complete all the success challenges (posting your comments, web pages, and videos in our V.I.P. social network) and you are not 100% satisfied, you can ﻿contact Sharon Love on facebook ﻿and she will return your money. We are that confident that you will be satisfied! Our goal is that every dollar you invest with us comes back to you 100 times or more this year. Click the button below to make a great living by making a difference. Thanks. Together, we can inspire the world.